Heavy Metal Designs are becoming more popular. One of my newest designs is called “Bear Burden”. It is created from Madagascar Leopard Jasper which is one of my favorite stones. The lovely spots on the stones make this gemstone a beauty. Also included is a picture jasper bear with a turquoise bundle on its back. Amazing Decorative hand-crafted brass Afghan pendants give a little class to this truly amazing necklace. 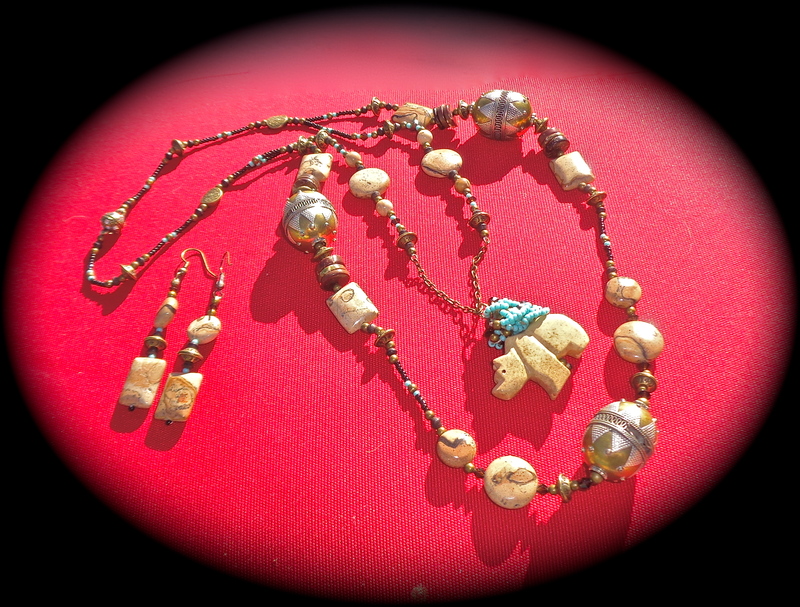 Brass beads, coins, bicones, and a studded crystal brass magnetic clasp completed this unusual piece. Description–Aventurine is generally green or could have metallic inclusions of fuchsite which gives it a brown color. Aventurine is also found in blue, yellow, peach, and even red. It is a form of macrocrystalline quartz. It is often mistaken for amazonite or jade and is often referred to as the green variety of sunstone. .
History– It was discovered by chance around 1700 in Italy. The Italian word for “chance” is “ventura”. Another version of it’s derivation is that in the 18th century, Venetian glass workers were preparing molten glass when fillings of copper fell into the glass mixture forming a sparkling mixture. In this version it is said that this “chance occurrence” gave the stone it’s name. Location–It is found mainly in Russia, India, Brazil and in the USA. Other deposits have been discovered in Tanzania, Japan, Canada, Madagascar, Norway, and Finland. Folklore/Metaphysical–Aventurine is said to help alleviate headaches and sleep disorders. In other circles it is said to be the stone of opportunity. 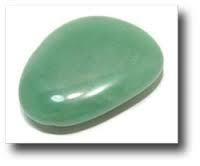 Care– Keep Aventurine from direct sunlight as it will fade in the light. To clean excessive soil use a mild soap and water solution, rinse carefully, and pat dry. Use a gemstone cleaning cloth for general cleaning. This is an amazing book which is highly recommended by Belle Armoire Magazine. 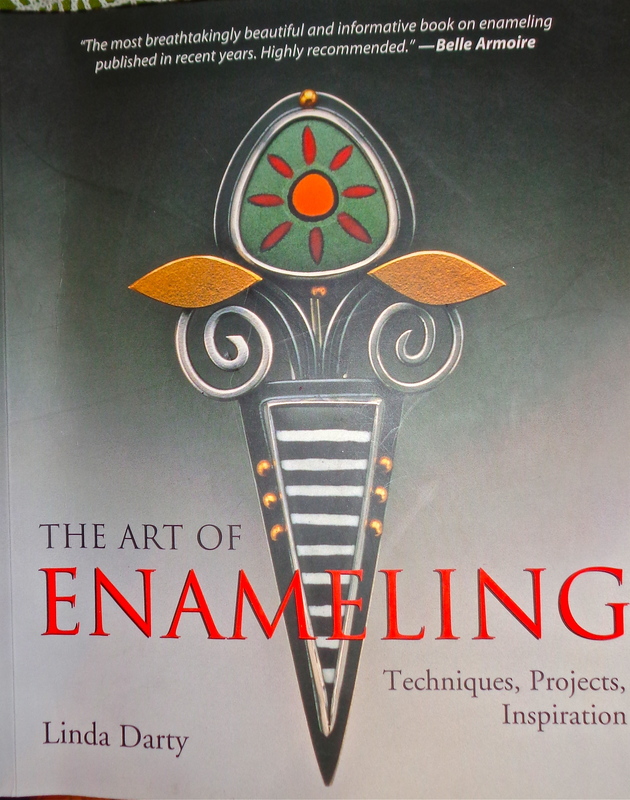 It is broken into three parts with Enameling Fundamentals, Enameling Techniques, and Projects. The projects are diversified and explained in detail like: kit needs, Kiln Kit, Metalworking Tool Kit, and Soldering and Annealing Kit or step-by-step instructions which are easy to follow. I highly recommend this book.